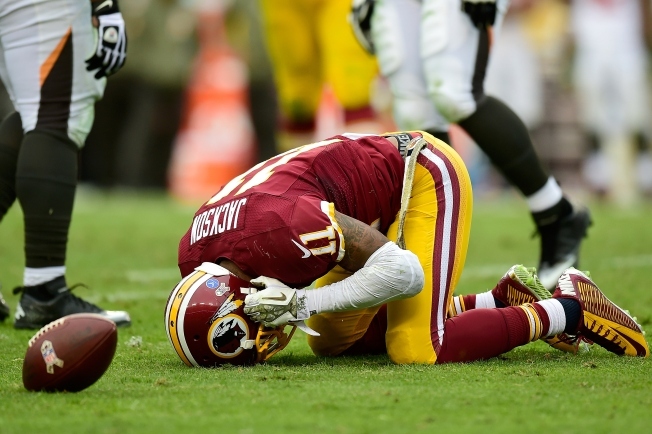 Did DeSean Jackson Call Out Robert Griffin III on Instagram? The Redskins' 27-7 loss to the lowly Buccaneers on Sunday led disgruntled fans to chant for Colt McCoy at FedEx Field after another uninspiring effort from Robert Griffin III. After the game, RGIII shouldered some blame, but also called for a full team effort to salvage whatever is left of this disastrous season. Last week, Jackson publicly supported Griffin after several media reports indicated that Griffin had alienated himself within Washington's locker room. "I've never been a vocal guy to yell at a player or get on another player," Jackson said. "That just wasn't me. Now I'm in my seventh year, I've been through a lot and I understand how things can be portrayed. That's the wrong impression you want to give when you have a young guy like RGIII being the quarterback and what he's been through in his career so far. I wanted to stand up and let him know I'm supporting him, and hopefully everyone else can support the situation, too." So much for that, apparently.